This mod adds religion to the world of Skyrim. You can now fully role play a priest, or crusader, or the like, by praying to your preferred divine, and acting in their name. The divines will now look at your actions, and may bestow blessings or curses on you. For those who are not fond of gods they may choose meditation as an alternative. Religion Mod - Tweaked and Enhanced You MUST download this mod first, let my scripts overwrite. cooltext.com for the logo and description text. -Fixed some MCM options not working properly. -Fixed a massive bug where a very small sin value could still be considered a major crime. -Fixed a typo in the Talos portion of one of the scripts. -So much stuff, I lost track. There was something about demon worship I think. 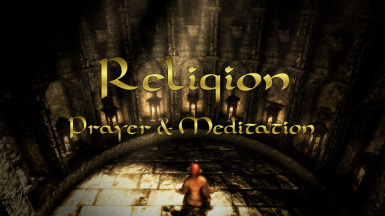 As the name suggests, this mod adds religion to the world of Skyrim. The player can now fully role play a priest, crusader, or demon worshipper, by praying to your preferred Divine or Daedra, and acting in their name. The Divines and Daedra will now look at your actions, and depending on whether you please or annoy them, they may bestow blessings or curses on you. For those who are not fond of gods they may choose meditation as an alternative. This mod is based mostly on role play and immersion. It is not meant to be a power grabbing mod where you will immediately become an OP holy knight or demon cultist (however you may become one eventually). This is meant to be similar to other Needs mods. 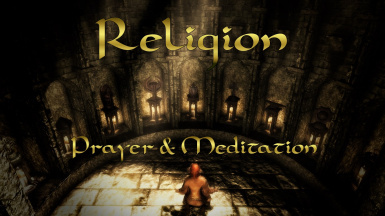 Religion is a need that some characters would have, as simple as a need to eat and drink, and this mod allows those characters to enact their religious beliefs. The mod mostly focuses on prayer, meditation, and worship as forms of religious enactment. You can pray to a Divine to revere them and gain favor from them. You can also pray to a Divine in hopes of gaining a blessing to aid you in your journey, with the more powerful blessings requiring you to wear the divine's amulet. For the characters that cannot or do not want to gain the favor of the divines, like thieves and assassins, they can meditate as an alternative, and look into themselves for strength in their journeys. For those with a greater lust for power, no matter the cost, they may look into Daedric lords as a source of power. To get started with prayer, activate any shrine and click Obtain Prayer Hymns. To get started with meditation, go to either the Riverwood Trader or High Hrothgar and find a book called On Meditation. To get started with Deadric Lords, read any vanilla book that talks about daedric lords. The Book of Daedra will tell you about all 16 lords. Thanks to MxR for his awesome spotlight! And Thanks to Brodual for his amazing review! Note: There is a slight inconsistency in the video. Meditation buffs your skills from the set you choose to meditate on, not your health, magicka or stamina. -Install: Simply install via NMM. -Unsinstall: Make sure you aren't praying or meditating, and make sure you are not in the vicinity of any shrines, as the shrines may become bugged and unusable, then simply uninstall via NMM. If you want to be extra careful you can use the MCM menu to remove blessings, curses, gifts, and meditate buffs. The options are in the Options page of the MCM, and require cheats to be enabled. If you are using pre-2.0 you can use the uninstall spell, called Uninstall Religion. You will need to add it to you via the console. -Update: If you are updating to 2.0 from a previous version you will require a clean save, if not simply uninstall the old version and install the new version. If you are making a clean save, make sure you are not in the vicinity of any shrines, as the shrines may become bugged and unusable. This mod does not use any continuously running scripts, so you can install and uninstall it at any time without much worry, just don't uninstall while you are praying or meditating, as you will be stuck and unable to move, and don't update or uninstall while you are in the vicinity of any shrines, as they may become bugged, and unusable. -Compatibility: This mod edits the vanilla shrines, the vanilla amulets, and a few books and actors. So the only incompatibilities should be soft incompatibilities that can be fixed via TES5edit. Akatosh says: Serve and obey your Emperor. Study the Covenants. Worship the Nine, do your duty, and heed the commands of the saints and priests. Arkay says: Honor the earth, its creatures, and the spirits, living and dead. Guard and tend the bounties of the mortal world, and do not profane the spirits of the dead. Dibella says: Open your heart to the noble secrets of art and love. Treasure the gifts of friendship. Seek joy and inspiration in the mysteries of love. Julianos says: Know the truth. Observe the law. When in doubt, seek wisdom from the wise. Kynareth says: Use Nature's gifts wisely. Respect her power, and fear her fury. Mara says: Live soberly and peacefully. Honor your parents, and preserve the peace and security of home and family. Stendarr says: Be kind and generous to the people of Tamriel. Protect the weak, heal the sick, and give to the needy. Talos says: Be strong for war. Be bold against enemies and evil, and defend the people of Tamriel. Zenithar says: Work hard, and you will be rewarded. Spend wisely, and you will be comfortable. Never steal, or you will be punished. The Nine say: Above all else, be good to one another. Prayer is another way to prove yourself to a Divine, albeit a very slow way. Once you have found a shrine of a Divine, you can receive a prayer hymn lesser power that allow you to pray to a Divine anywhere in Skyrim. Praying to a Divine is a simple process; you can use the prayer lesser power at any time, while you are not in combat, to start praying. While you are praying you cannot move or attack, and if someone starts combat with you, your prayer will be interrupted with no progress added. Prayer requires actual in-game time to receive any attention from a Divine. For most Divines, performing a small good task is worth praying for a full 24 hours of in-game time. However, you can make your prayers worth more by performing additional actions. If you pray at a shrine, or while wearing a Divine's amulet, you will be able to make your prayers heard much more easily. If you have found a Divine's shrine, you can also receive a lesser power to ask for a blessing from that Divine. How likely you may receive a blessing is determined by how virtuous that Divine deems you. Again, performing virtuous deeds or praying to a divine makes you more virtuous, and more likely to receive a blessing. Like prayer, you can perform additional actions to increase your chance of receiving a blessing; asking for a blessing at a Divine's shrine, or using the lesser power while wearing the divine's amulet both increase your chances of receiving a blessing. Each Divine is able to give four different blessings; a standard health blessing, that gives you additional health once you have been beaten down to a certain health threshold. Each Divine can also give three unique blessings. These unique blessings require additional actions to be 'activated'. All of them require you to wear a Divine's amulet, some also require you to be in combat, and the most powerful require you to be beaten down to a certain health threshold. Each blessing also comes in several tiers, that can be reached through becoming more and more virtuous. Each blessing lasts a random amount of in-game time, usually a few in-game days. Curing diseases is also now done through blessings. You can only get your diseases cured at a shrine, and the chances of getting cured is dependent on how virtuous the divine deems you. However, it is much more likely to be cured of diseases then it is to receive a blessing. If you have done enough sinful actions to outweigh your virtuous actions, you will have to repent at a shrine. Initially this won't be that detrimental, it will simply interrupt your progress with that Divine until you visit their shrine. If you continue doing more and more sinful actions, even if your virtuous actions continue to outweigh them, you will eventually have to experience a curse. Each Divine has a unique curse that they will give you, each of which is incredibly detrimental, and they will last a few in-game days. Also, while you have a Divine's curse, you cannot receive a blessing from any other Divine. Take that into consideration before accepting a curse. Getting a curse is an entirely voluntary action, you will have to go to that Divine's shrine and willingly accept the curse, a Divine will not force them on you. However, until you accept that curse, you will not be able to pray, or ask for blessings from that Divine. For those that want power, no matter the cost, Daedric Lords are a viable, and risky, option. Daedric Lords are often considered 'evil', however history proves them to be 'apathetic', which may even be worse. Daedric Lords don't care about human lives, no matter what any worshiper may say. They care about what you can offer them, and that's it. For many of the Daedric Lords, what you can primarily offer them is entertainment, a few others want you to perform rituals and actions, and a few genuinely want your loyalty and adoration, but they all only care about you if you can offer them something. In addition to being apathetic, the Daedric Lords are also fairly narcissistic, and worshiping them is probably the most reliable way to get a Daedric Lord's ear. In order to start worshiping a Daedric Lord, you need to learn about them, more specifically, you need to read about them. If you find a book that talks religiously about a Daedric Lord, you will receive a lesser power that allows you to worship that Daedric Lord, and ask them for gifts. Worshiping is similar to prayer, in that you can start worshiping anywhere, as long as you are not in combat. You cannot move or attack while worshiping, and if someone starts combat with you, your worship will be canceled, as well as any progress. Like prayer, this requires actual in-game time to have any effect. You can also perform additional actions to make your worship more amusing for a Daedric Lord. These actions are different for each Daedric Lord, but most will be amused if you are wearing their artifact. Daedric Lords are also effectively the enemies of the Divines, so if you start worshiping Daedric Lords, the Divines will not be pleased. Simply worshiping a Daedric Lord will cause all Divines to remove their blessings from you, and you will be deemed less virtuous for worshiping Daedric Lords, and for asking for gifts from them. Daedric Lords are incredibly powerful, and might be convinced to share that power. Once you have gotten the worship lesser power for a Daedric Lord, you can ask them for a gift. Each Daedric Lord has three unique beneficial gifts. If you manage to receive a gift, you will have it permanently, but you may not want it permanently. These gifts can be incredibly powerful if given to the right person, but they all have drawbacks. Many Daedric Lords want something in return for giving these gifts, for many some entertainment is all that's needed, others want to spread their influence into Skyrim through these gifts, others require some action before you will actually receive the gifts' effect, and for a few the drawbacks are simply due to the nature of the gift itself. In addition to the drawbacks of the gifts themselves, simply asking for a gift can be risky. Many of the Daedric Lords are unpredictable, and their moods can shift at a moments notice. Also, many of the Daedric Lords will become bored if you don't continue to amuse them. If you happen to ask for a gift while the Daedric Lord isn't pleased with you, you are very likely to receive an incredibly detrimental gift. Each Daedric Lord has one of these unique 'gifts' that are used to punish annoying worshipers. These gifts are permanent, like the others, but have no benefits. They are used by the Daedric Lords, for amusement, or to spread their gift. If you happen to receive a gift that you don't want, there are very few ways to remove it. You can try asking the Daedric Lord that gave you this gift to remove it, but that requires you to have a good relationship with that Daedric Lord, and you may get a beneficial gift removed, otherwise asking to remove the gift may only result in annoying them even more. The only other option is to try to seek redemption through the Divines. If you manage to redeem yourself and become virtuous in the eyes of a Divine, and then ask for a blessing, you may be cleansed of all Daedric powers, and all gifts from all Daedric Lords will be removed. For those that don't want to rely on some other being for their strength, they can look inward for greater strength. Meditation is a way to reflect on your experiences and get further insight from it. To start you need to find the book On Meditation, which can be found in the Riverwood Trader, and in High Hrothgar. Once you read it you will get the meditation lesser power. Meditation is similar to prayer and worship; you can do it at any time while you are not in combat, you cannot move or attack while meditating, and if someone starts combat with you your meditation is canceled with no progress. When you meditate you can choose to focus on your Warrior, Mage, or Thief skills. Once you stop meditating you may get a small buff in one of the skills you meditated on. These buffs are always active, but only last a few in-game days. The longer you meditate for a single session, and the longer you have meditated in total, the more likely you are to become 'enlightened'. These buffs can become very powerful if given enough time, but meditation is still the slowest way to become stronger through this mod.